Since the Sarin attacks in Damascus on August 21st 2013 I’ve spent a lot of time examining various aspects of the attack, from the munitions used to various claims and counter-claims about who was responsible for the attack. One point of debate has been the range of the Volcano rockets used to deliver Sarin in the east of Damascus. Work by the Ted Postol and the late Richard Lloyd pointed to a range of “about 2 to 2.5 kilometres“, which led to claims from some quarters that this range would mean that the Volcano rockets could not have been fired from government controlled territory, as it was assumed the front-lines were more than 2.5km away from the impact sites of the rockets. However, my own work analysing videos and other information posted by both sides in the conflict, including videos from the Russian language news network ANNA News who were embedded with Syrian government forces in the area, established the front-line positions were within 2km of the impact sites. My analysis, Identifying Government Positions During The August 21st Sarin Attacks, established the following area as government controlled after the Syrian military’s Operation al-Qaboun. One difficulty I faced piecing together the front-line positions was the lack of up to date satellite map imagery available on Google Earth of the area. After a long wait, there’s now imagery on Google Earth showing the area only a few days after the August 21st Sarin attacks, dated August 24th, that adds to the evidence government forces were within range to launch the Volcano rockets used on August 21st, as well as some other interesting details. In the below image the south-east corner of the territory I established was controlled by the Syrian military is shown, along with red rings showing a distance of 2km away from 5 impact sites geolocated by myself and others. These impact sites represent those furthest south and east from government controlled territory. Thanks to the new August 24th imagery on Google Earth it’s now possible to see tanks were operating in the area, apparently heading south from the government controlled area. Just a hundred meters to the north there appears to be a vehicle park, including a number of tanks. To the south-east there’s another position, and I believe this is what was described as the “Electricity Station Checkpoint”, one of a number of checkpoints in the area (mapped here). This position is less than 2km away from the impact points furthest south. South along the highway is “Tohme Cheeckpoint”, which appears to the the furthest south government control extends in the area. 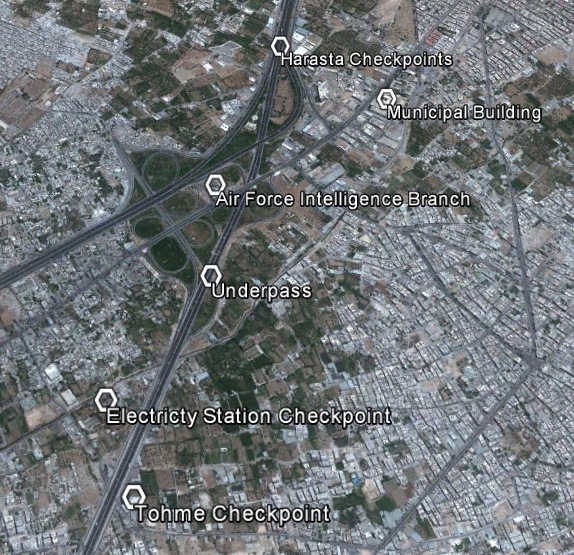 This checkpoint was attacked on August 21st 2013 in response to the Sarin attacks, which followed an earlier attack in June, with both attacks resulting in buildings in the area being destroyed by VBIEDs. The updated satellite map imagery shows both buildings that were destroyed in the attacks. It’s also been possible to find other locations where tanks were based using the August 24th satellite map imagery, showing government forces felt secure enough in the area to park large groups of tanks and other vehicles. The Google Earth KMZ file containing the above information can be found here. ANNA News published a number of video from government’s military operation to clear the area, all of which I geolocated as part of my analysis of the front-line positions on August 21st. What’s particularly interesting about the August 24th satellite map imagery is it appears that many of the buildings visible in the last video in the sequence, published on August 20th, have been demolished. Although ANNA News has made all the videos related to this military operation private, copies have been uploaded elsewhere, and in this video we see a tour of territory captured by government forces. I managed to geolocate this position using imagery that was on Google Earth several months ago, images taken many months before August 21st. One of those image is visible on the left of the below picture, and the satellite image from August 24th is shown on the right. The car icon marks the burning vehicle visible in the video. This destruction can be seen throughout the area, but it’s clear this must have been done very soon before August 24th, as the video published by ANNA News on August 20th shows most of the buildings filmed in the area are still standing. Why this demolition was done in the area is unknown, but it seems clear based on the August 24th satellite imagery that the government forces were well established in the area.